Finding a child-friendly vehicle shouldn’t mean sacrificing strength. Popular among small to midsize families, the 2019 Ford Escape and the 2019 Hyundai Tucson are two options that provide comfort and thrill for parents and children alike. But which of these family favorites brings the most power to the road? The 2019 Escape comes in first when it comes to standard performance, with its standard engine delivering faster acceleration and more horsepower and torque than the 2019 Tucson. 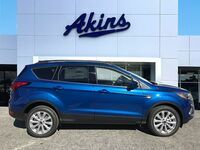 When looking at the other engines offered on each model, the Escape comes ahead yet again. The following guide provides an in-depth comparison of the engine performance of the 2019 Ford Escape and the 2019 Hyundai Tucson. 170 lb.-ft. Standard Torque 151 lb.-ft.
9.1 sec. Standard Acceleration (0-60 mph) 9.7 sec. The 2019 Hyundai Tucson’s SE and Value trim levels come equipped with the standard 2.0-liter DOHC 4-cylinder engine, which delivers 164 horsepower and 151 lb.-ft. of torque. 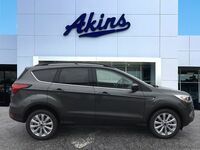 The 2019 Ford Escape S’s standard 2.5-liter DOHC 4-cylinder engine outperforms the Tucson's, delivering 168 horsepower and 170 lb.-ft. of torque. The Escape also accelerates faster, going from 0 to 60 mph in 9.1 seconds. Clocking in at 9.7 seconds, the Tucson lags behind by .6 seconds. The Tucson SEL, Sport and Limited get upgraded to a 2.4-liter DOHC 4-cylinder engine, which delivers up to 181 horsepower and 175 lb.-ft. of torque. This is matched by the Escape SE and SEL’s 1.5-liter Turbo 4-cylinder engine, which delivers up to 179 horsepower and 177 lb.-ft. of torque. 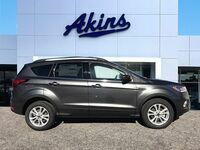 The Escape’s top-level Titanium trim gets upgraded again to a 2.0-liter Turbo 4-cylinder engine that cranks out 245 horsepower and 275 lb.-ft. of torque. Interested in a 2019 Ford Escape?